I ran the loop backward today so I could throw my blockbuster DVDs in the mailbox. I had Mike Fox drop me off 4.5 miles from my house so I could run home. 17.5 miles on the bike. My legs were really sore this morning. I couldn't even hardly touch my toes when I stretched out beforehand. I thought for sure I was running 9 minute miles. I guess I was only running a little slower than I have been. Maybe that's a good sign. We'll see how I feel tomorrow. Time: 23:40 (8:03 pace) new record!! My legs didn't feel nearly as sore as they did yesterday. I took a little longer to stretch out. Maybe that helped. All the sit-ups I've been doing lately have me feeling like I'm going to puke. That gives me an idea for a scientific break-through in weight loss. Eat as much as you want, then puke it up before it digests! It could change the world! Distance: 8.75 miles. I got a flat and Mike Ambrosio picked me up. This newspaper clipping is from 1991. Here are the things you need to know about it: 1. Look at my perfect running form coming across the finish line. 2. Check out my genetically huge calfs. All McCumbers have them. 3. Look at that mop on my head. My hair was always so long in high school because I always had track or cross country practice after school and a meet on Saturday. I wouldn't let my dad cut it because he would always buzz it. 4. The sweet farmer tan. No, that's not a problem with the film. That's actually how white my legs were/are. 5. See the mini van in the background? I had to drive that to school every day. I had to take all my brothers and sisters, their friends, and their friends' brothers and sisters to early morning seminary. Thankfully my brother totalled our hideous 12 passenger van the year before. 6. 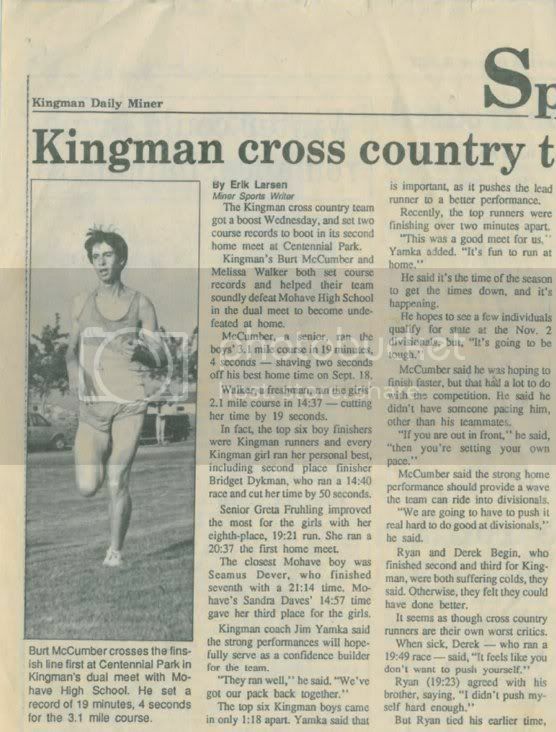 As you can see in the caption, I set the course record. That record still stands today. It doesn't matter that it hasn't been run since, what's important is that it still stands today! Happy Halloween! Below are myHollywood lookalikes. 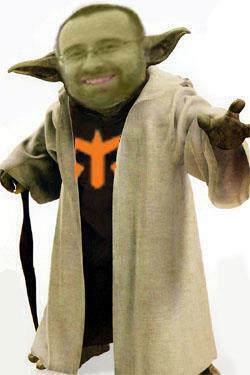 I did one for everyone at work. I'll post Camille's later. One of these is me on my mission. Can you guess which one is the real me? An uncanny resemblance. 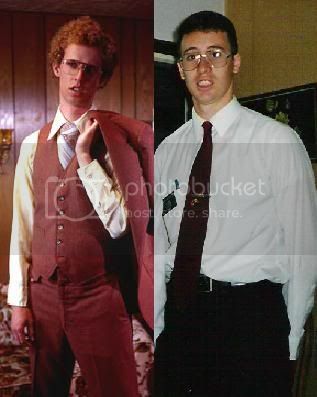 I'm the original Napoleon Dynamite. The Govenator's got nothing on me! I rode my bike 11.12 miles this morning. I had about a 2 min. rest and then off and runnin'. I'm doing just under what I'll be doing next week when I do the triathlon (12 and 3.1 miles). The problems are I haven't been in a pool since my last triathlon, and I know there are some significant hills to which I haven't trained at all for. I'm still optimistic. I know I'll do better than last time.